Lunar Eclipse 2019-01-21 | Flickr - Photo Sharing! 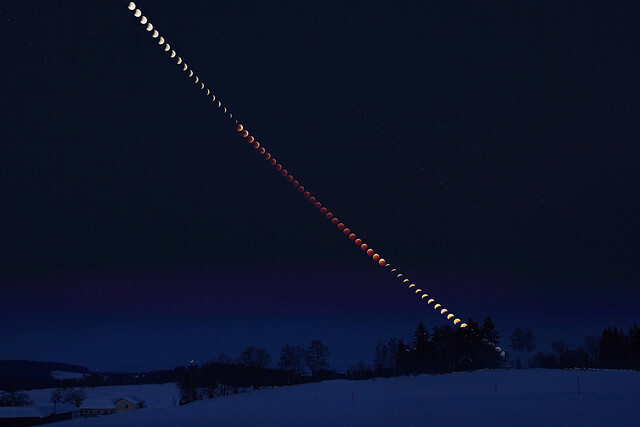 Time lapse image of the total lunar eclipse that took place in the early morning hours of January 21, 2019. Time between each single image was three minutes, total time covered is about three hours. Exposure time was 0.5 seconds at f/5.6 and ISO 800 during totality, and 1/250 to 1/45 second at f/5.6 and ISO 100 during the partial phases. Camera used was a Canon EOS 550D, the focal length was set to 24mm. To the right of the eclipsed moon, multiple images of the stars Castor (Alpha Gemini) and Pollux (Beta Gemini) can be seen. Images of Regulus (Alpha Leonis) are visible in the upper left corner of the image. This is not a Photoshop composite. It is a series of images that were taken with the camera on a fixed tripod, programmed to take photos in regular intervals from the start of the eclipse until moonset. These individual shots were stacked to show the true path of the Moon across the sky during the eclipse. The composite was created using StarsStaX software that I usually use for my star trails images. This image has been published as 'Bonus Earth Science Picture of the Day' on the Earth Science Picture of the Day Facebook Site on January 30, 2019. SAMCRO81, Claude@Munich, Victor Ka, and 34 other people added this photo to their favorites. Wow! Very cool image. Well captured! This is very well done. Thank you for sharing your work! Don Arsenault b.shutterbug Thanks, I am happy you like that image. I like all your pictures, but this one is exceptional. Such good planning to get the whole eclipse in one frame! Now, I'm curious, how did you keep your camera going for so long in the cold, didn't the battery die? And how did you keep warm yourself? George Preoteasa Thank you, George. I am happy that you like my images, and that one in particular. The plannig was not that hard. I just calculated the difference in altitude and azimuth of the Moon at the beginning of the eclipse and at moonset, to see what focal length I could use and where to put the Moon in the first frame. The camera, timer and batteries worked all pretty well in the cold (-9°C or about +16°F) for nearly four hours. The only "special" equipment I used was a small heater for the lens. At the end of the run, the tripod and the camera body were all covered with ice, but the lens was still clear, thanks to the heating.